The 1933 Goudey Sport Kings set is a beautiful offering filled with superstars from the 1920's and 1930's, hailing from many different sports and walks of life. This set is renowned for it's vibrant color fronts and just clean and crisp overall look. The set includes 48 cards that measure 2 3/8" x 2 7/8". The card fronts feature color portraits with the players name listed at the bottom. The card backs are in printed in green and have interesting biographies on each "Sport King." This set includes only three baseball cards: #1 Ty Cobb, #2 Babe Ruth, and #42 Carl Hubbell. We previously blogged about the beautiful # 2 Babe Ruth SGC 8.5 NM/MT+ we have for sale at DeansCards.com. This card of the sultan of swat is perhaps one of the most attractive cards from the 1933 Goudey Sports Kings set, and maybe one of the Bambino's best looking cards of the 1930's. 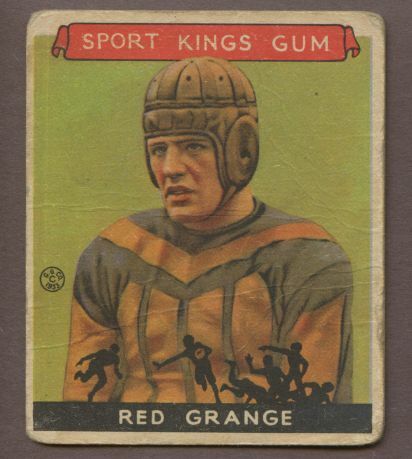 Football players Red Grange, Jim Thorpe, and Knute Rockne are also featured cards. The black silhouettes that illustrate the bottom border of the football cards are cool. They show scenes such as that of a player diving for a touchdown, or a big pileup of tacklers with the runner doing his best to evade the scrum. The 1933 Goudey Sport Kings set includes some of the first professional basketball cards ever. This was also the only multi-sport offering sold by the Goudey Gum Company. The rest of the Pre-War vintage card set consists of ice skaters, hockey players, aviators, swimmers, and even golfers (notably Bobby Jones and Gene Sarazen among others!). Dean's Cards has a variety of different 1933 Goudey Sport Kings, 1933 Goudey Sport King Reprints, and other issues from the Goudey Gum Company. We also have a variety of other sets produced by the Goudey Gum Company, including: 1933 Goudey Baseball Cards, 1934 Goudey Baseball Cards, 1938 Goudey Heads Up Baseball Cards, and 1933 Goudey Indian Gum Non-Sports Cards.